The Dragon class had been a challenge to play through Normal difficulty, although not quite as bad as I had initially feared. Once I started to get used to the weird flying movement of the Dragon, I was able to avoid most of the enemies and their relatively simple attacks. The tier 1 monsters simply aren't that tough in this game, and the tier 2 monsters only a little bit more challenging. With the Dragon class, everything was awesome... until I took damage, at which point in time the runs would always become a frantic struggle to avoid death. If you read through the first page of this report, you probably noticed how more than one character was sailing along in perfect health, only to be dead in mere seconds from one mistake or unescapable situation I couldn't fly out of. For that matter, I should take a second here to explain how the flying mechanic works. 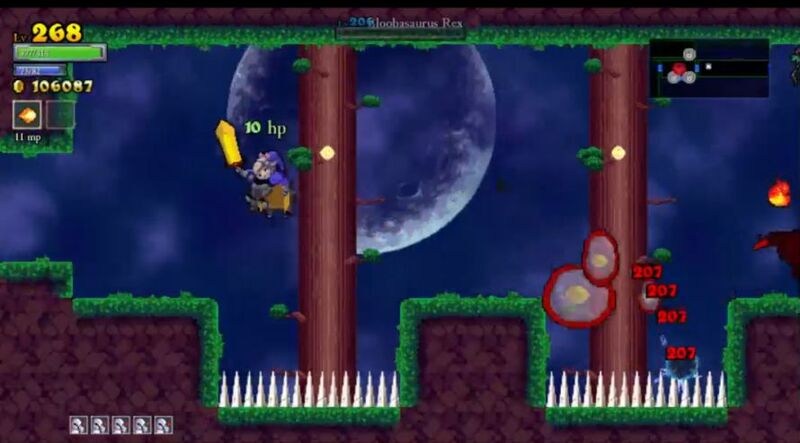 Dragons cannot jump in this game, and hitting the normal jump button will cause them to go into "flight mode", for lack of a better term. When in this mode, you simply move the D-pad to fly in any direction. Taking damage will knock the Dragon class out of flight mode, as will pressing the jump button a second time. Naturally you'll spend almost all of your time in this flight mode, except that it's impossible to open treasure chests or use the teleporters/enter the boss rooms while flying. You must land to do any of these things, and that can sometimes cause problems in a crowded room. I have also tried to fly away after landing, while forgetting that I was out of flight mode, only to watch a Dragon stand in place doing absolutely nothing! As I said, moving these characters takes some practice. I used the gold from the successful Normal difficulty run to open up the Randomize Children trait and cut down on the need to reroll more heirs. This seemed like the right time to do so, when I'd still go through enough future characters to make it worthwhile but late enough that the pricey cost (about 6000 gold) wouldn't be prohibitively expensive. The rest of the cash went into my core Dragon stats: Health and Intelligence (magic damage). Ambivelous and Nearsighted. Lady Shanoa was still using the backwards-firing fireballs and had the blurry vision. I also hoped for a chance to dump the Hedgehog's Curse somewhere along the way. This character seemed to have few problems making her way through the castle region, which was to be expected. I had to full clear the entire Normal dungeon a couple of extra times to defeat the final bosses, and that left these Dragons a bit overleveled for the early portions of NG+ difficulty. I did notice that the Gray Baron monsters (tier 2 knights) did enough damage to kill my girl in two hits. Better not take damage then! I fought the dual mage minibosses (who dropped the useless Holy Chestplate) and went into the boss room to face Khidr immediately when I found it. The big eyeball was completely unable to damage my Dragon, who flew effortlessly between the red blobs and was never touched. Easy victory. I discovered several different pieces of gear on this run, although only the Dragon Bracers were an upgrade over current equipment. Dragon Bracers on a Dragon character, how appropriate. I was making good progress through the forest as well, then decided to take a shot at Alexander. That did not go well; the boss could breed minions faster than I could kill them, and my Dragon girl was eventually swarmed over and defeated. Have to try that one again at a higher level. Colorblind and Coprolalia. This Dragon no longer had to deal with backwards fireballs, hooray! Unfortunately everything was in black and white, straining the eyes and making it harder to see. There was a very tough room layout at the beginning of the castle, with about six eyeballs and four plankies inside, and I don't have the faintest clue what I would have done in there on the next difficulty level. Died, most likely. 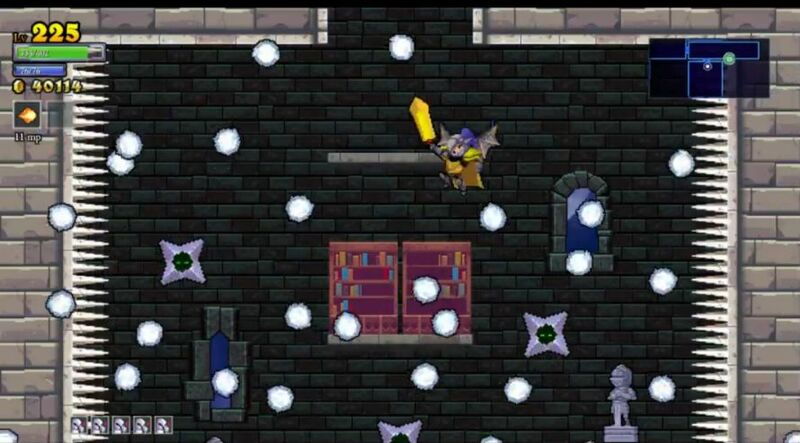 It was easier after that, and once again I was able to clear the castle without much trouble. I was even able to win the dagger-tossing minigame, and the chest had a Health bonus inside! Awesome. Inside the forest, I was able to turn up the Royal Helm, which I knew my Dragons would be wearing for the rest of their days. Too much health and mana on the Royal Helm to pass up, and the Dragons needed both stats in a major way. 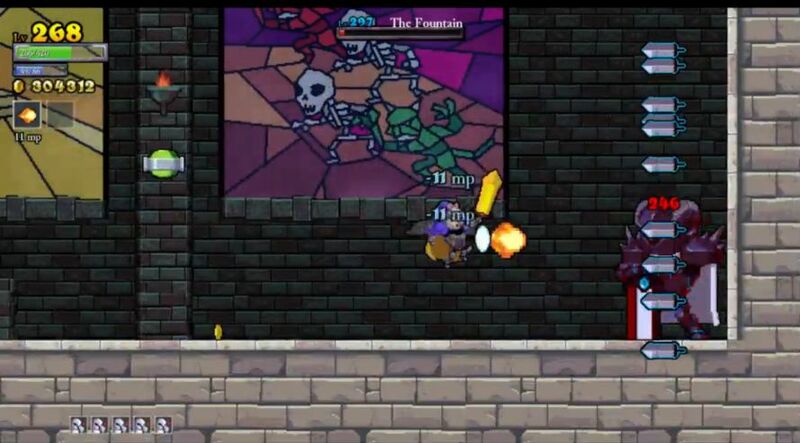 I had a similar reaction when a Sallos miniboss dropped the Royal Sword - best sword in the game, woot! - and then I realized a second later that Dragons don't use swords or the Strength stat in any way. What a buzzkill. I cleared the rest of the forest and ventured into the tower, where I took three hits in a single room and died immediately before I could retreat and pick up some recovery items. Ah well. This was still a very solid run. I used the gold to equip the Royal Helm and sank the rest into the standard assortment of stats, Health and Intelligence. Tunnel Vision and Gay. This Dragon was back to full color, and she was also the first one to top 300 HP. I was getting close to maxing out the Health stat though, and I knew things were about to get immensely harder on the next difficulty level. Since my Dragons were continuing to get stronger and stronger with each new heir, while the dungeon itself was remaining the same, I don't have too much to say about the early portions of this run. The castle was cleared without any major problems. The forest threw out some of the nastier room setups, the ones that have fire traps everywhere mixed in with monsters, and I took some damage passing through these areas. In better news, Helios' Blessing was sitting inside a secret shrine, and that was the perfect addition to a lengthy run. This item ensures that every monster killed will drop gold of some kind, and I still had half the forest and all of the tower and basement left to go. The extra gold income was clearly noticeable. The tower proved to be fairly routine; I think that I took less damage in there than back in the forest. The highlight was probably taking on the duo plant minibosses, who managed to hit me one time and dropped the (useless) Imperial Sword. I found myself running out of mana against them, a problem that only seemed to pop up against bosses. Fortunately I usually had plenty of mana for fireball use against normal critters. There was also one room in the tower with about ten of the flying cloud enemies (pyrites) inside, and that one I had to skip. Unlike the normal sword, Dragon fireballs can only hit one target at a time; that room would have been a massacre, and not of the monsters. The first room of the basement was extremely crowded, and I had to retreat more than once before I finally managed to get it under control. That was the hardest challenge in the whole area, with only one other room full of ninjas that caused a need for serious dodging. Soon enough it was all finished, complete NG+ dungeon clear with 93k gold in the bank. I didn't have full health at this point, but there was nothing else to do except fight the bosses. I went after Ponce de Leon first, knowing that the Dragon's skillset works well against him. 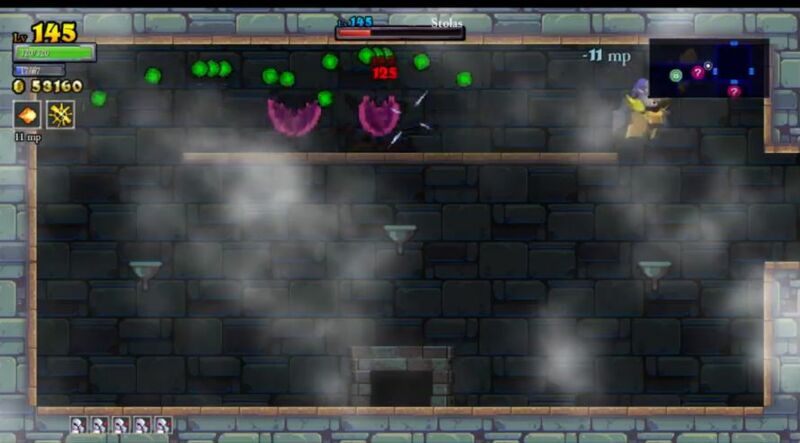 The bouncing spiked balls were concentrated in the top left corner of the room, and they managed to hit me once when I flew up in that direction. Otherwise this was an easy battle, just stay ahead of the blazing fireball and keep shooting away. Two hits would have defeated me, but the boss only landed the single one. I opted to go after Alexander next, and that may have been a mistake. With only about 200 health to work with, I might have done better by trying to lifesteal off of Herodotus. In any case, it became a moot point. The skullhead minions still took 3 hits to defeat (I had been hoping for 2 hits), and they slowly overwhelmed me. I couldn't even hit Alexander himself because the minions blocked my Dragon fireballs. This was another place where running out of mana was a huge issue. It seems that the Dragon class simply doesn't handle large flocks of enemies very well. Defeat here at the end of a nice run. Colorblind. This is always annoying for the Livestream viewers. The goal for this character was to complete another full clear of the whole dungeon, and then see how much progress I could make against the bosses. I started in the castle as usual, headed up to the tower, made some progress up there and had to retreat to easier areas after taking some hits. The random monsters were fairly routine by now, and with +10 HP per kill, it never took long before my Dragon lady was back into the safe zone. I had good luck with the fairy chests that I found along the way, finding an Armor bonus and several Health ones. Even at a mere +2 max health per chest, every little bit helped. The bright red of the health upgrade really popped on the black and white screen too, a small splash of color before returning to drab grayness. There were a lot of normal treasure chests trapped behind walls on this run; I found five of them just in the castle and tower. That was likely close to 10,000 gold sadly going to waste. The basement was next, and it actually turned out to be easier than the tower. The highlight here was clearing out a fairly nasty "defeat all monsters" challenge without taking a hit, while making liberal use of the step-in / step-out tactic of approaching rooms. Kill one enemy at a time, leaving and re-entering the same room repeatedly just before taking damage. The forest was the last area, where I had the unfortunate luck to pull Hedgehog's Curse from a secret shrine. That was going to be annoying against the endgame bosses. Soon enough it was all completed, another easy full dungeon clear. Because so many of the normal treasure chests had spawned behind walls, I wound up with a very low gold total, only 71k. For NG+ difficulty, that was one of the lowest I've seen on a full clear. This left the ending boss gauntlet. Since I'd killed Khidr and Ponce de Leon with previous characters, I had two bosses and then the final pair remaining. I opted for Herodotus first, as two previous heirs had already fallen to Alexander. It was a bit of an unlucky break to find that I was just short of enough damage to kill the Herodotus blobs in two shots; I checked and they had 7 out of 339 health remaining. Guess it was three fireballs apiece then. I kept taking my time, spending a lot of time up near the ceiling of the room, working over the blobs one at a time. 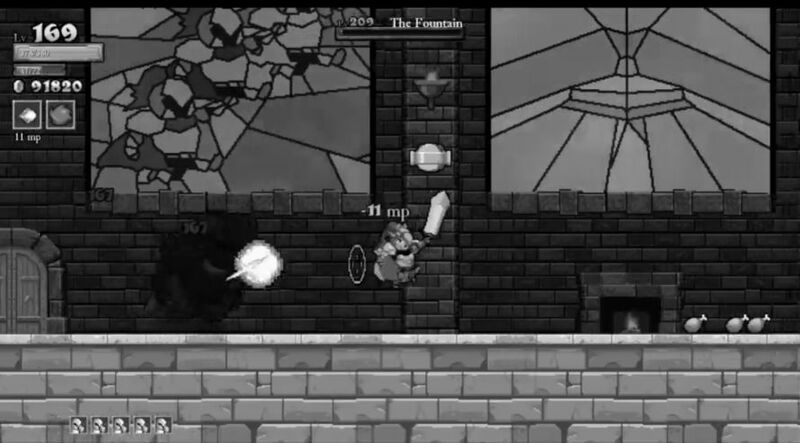 The Dragon class performs extremely well in this battle, removing the floor spikes from the equation completely. One at a time, one at a time. Four and a half tense minutes later, it was over with a perfect flawless victory. No damage taken at all. I believe that was the first time I ever managed that. Alexander was the one boss remaining, and unlike Herodotus, this seems to be a fight where the Dragon class struggles. Alexander will eventually overwhelm your character with hiss little flying skullhead minions, and this causes major problems because of mana concerns. 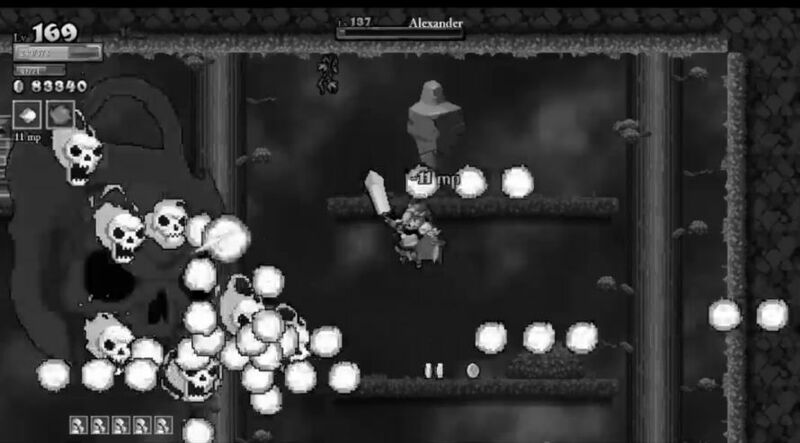 You need to hit Alexander himself with fireballs, and you need to hit the minions with fireballs, and it quickly drains Dragons of mana. Every other class can always use their sword! So anyway, once against Alexander filled up the room with flying enemies, and once again they turned this into a tense encounter. Fortunately I was able to pump out enough damage to finish the boss before the swarms of monsters could take down my character. This was not smooth at all - Alexander was a true challenge, by far the hardest of the four normal bosses. The final pair has an interesting dynamic for a Dragon. It's relatively easy to dodge their attacks due to the flying ability, but if your character does get hit, the tiny health total will result in near-instant death. Very much in character for this class. I used fireballs to keep Johannes back in the first phase, pushing him away so that he couldn't use his melee sword swing. Otherwise, I kept dodging the daggers and axes, and flew up to the ceiling whenever he tried to corner my character. No damage taken, on to the next phase. The Fountain can be very easy or very hard depending on how often he chooses to summon his flying swords, and on this occasion he chose to be easy. He only did his flying sword attack a couple of times, and they weren't too tough to dodge. Most of the time, the Fountain kept shuffling back and forth aimlessly without doing anything, allowing my Dragon to pelt him with fireballs. I shot so many that I ran out of mana at one point, actually drinking the flasks on the ground to refill. The whole thing took about thirty seconds: no damage taken, another flawless victory. Three different bosses done without taking a hit! The return to a color screen made this picture seem unusually bright. You can actually see what armor my Dragon girl was wearing! I only needed four total heirs to make it through NG+ difficulty, which often seems to be the case now. New Game Plus never seems to take that long, it's getting started in Normal and then coping with the scaled up tier three monsters in NG++ mode that cause the most trouble. Well, that was next on the agenda. On to the final difficulty level. With this gold, I decided that I needed to improve survivability. That meant maxing out the last five remaining points in Health (75/75), and then spending on the Armor stat for the first time. Increased armor reduces the damage taken when your character gets hit, so it's another form of health in this game, albeit one with diminishing returns due to the way the damage reduction formula works. I would end up dumping 23 level ups into armor, increasing it by almost 100 points and lowering my damage taken substantially. I hoped this would allow future Dragons to live a bit longer in the wilds of NG++ difficulty. After purchasing those upgrades, Lady Teresa II had exactly 400 health and 50% damage reduction from armor. Unfortunately she still had Colorblindness trait to turn everything black and white, and that stupid Hedgehog's Curse item from the secret shrine causing her to lose gold with every point of damage taken. I spent so much time with this one Dragon, it really did feel like a curse. I wasn't sure how well things would go for a frail Dragon given the increased difficulty of New Game Plus Plus, only to be pleasantly surprised by how well I was able to handle the monsters in the castle. The maneuverability of the Dragon allowed me to dodge most attacks, and the extra range of the fireball as opposed to the sword came in extremely useful. The best example came against the McRib skeletons, which longtime readers know are my least favorite enemy in the game. The Dragon class was able to shoot fireballs from out of range of their avalanche of bones, and generally avoid taking any damage. Look at the picture above: that's how far away a fireball will travel, and demonstrates how I could fight these terrors in (relative) safety. This was much better than I'd been expecting, and it made a real difference in reducing damage taken. Having five Vamprire Runes for +10 HP per monster kill was another lifesaver. I made smooth progress through the castle, killing Botis and picking up the useless Slayer Sword for my troubles. I found a lot of the Slayer stuff on this run, none of it even the least bit helpful. Arguably the biggest problem came from my Dragon girl getting stuck in the floor while flying close to the ground. I've mentioned before that this will happen occasionally and eat your movement inputs, and it drives me crazy since it nearly always results in a hit. Let's just say that this happened a lot on this run. There were some close calls at times - a Dragon with 400 max health is never very far from the danger zone - but my progress was fairly steady overall. Eventually I cleared the castle in full, taking out Khidr in the process without taking a hit. 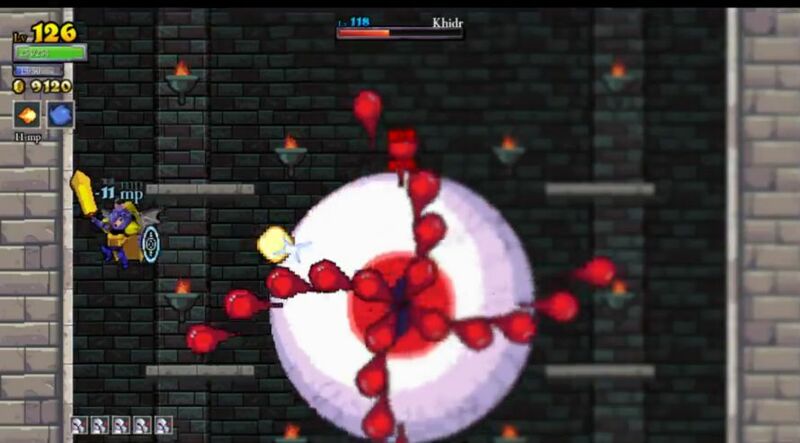 (The huge immobile eyeball is very easy for a character who can fly indefinitely.) First room of the forest was a real nightmare, with fire mages and flying skullheads and plants, with projectiles absolutely everywhere. I had to retreat in and out of that room about a dozen times before finally clearing out enough room to make progress. There were a lot of blobs in the forest, and they were tougher to fight than I expected due to the fire trails that they left behind. The fires limited my Dragon's mobility, and that's the top strength of the class. When you can't fly, or you get constricted into narrow spaces, it gets a lot harder. (And Hedgehog's Curse doesn't make things any easier...) Floors also continued to terrorize me, as I was stuck in the ground TWICE on top of pressure plate spikes. Some of the dumbest hits I've taken in a while, argh. I went down as low as 12 HP at one point, grabbed all the saved up chickens, then returned and managed to get the run rolling again via lifesteal. Eventually I full cleared the forest as well and headed up into the tower. There were few resources left at this point, and one long horizontal room had a very nasty mix of monsters in it. I somehow managed to clear another half dozen more rooms before a guardbox took me out with a series of well-place homing missiles. For the first character on this difficulty level, I was very happy indeed. Without Hedgehog's Curse, the result would have been even better. I sank most of the profits of the run into 20 magic damage upgrades. This would do the most to make me safer, reducing the number of fireballs necessary to kill monsters. Too many of the enemies had required four or five shots apiece on that last run. I was hoping to take that down into the two to three shot range. Alzheimer's trait: no access to the map screen, only the minimap. That's always an annoying trait, even if you can get a view of the overall dungeon when standing on the teleporters. The extra damage from all those levels in Intelligence equated to 40 more damage per fireball, and the difference was immediately noticeable. A lot of monsters dropped from "four hits" down to "three hits" and that sort of thing. I was a bit sloppy through the early portions of the castle despite this extra damage, which was kindly erased through frequent random chicken drops and a fountain refill. Cleared out the rest of the castle without too much trouble, the most interesting room having five plonkies inside, which turned it into a true bullet hell. Fairy chests kindly kept giving me Health bonuses, three of them in all. That increased maximum health all the way from 400 HP to 406 HP. Poor fragile Dragons, sigh. The first two forest rooms were extremely nasty, and I was forced to burn through most of my teleporter chickens just to get through them. 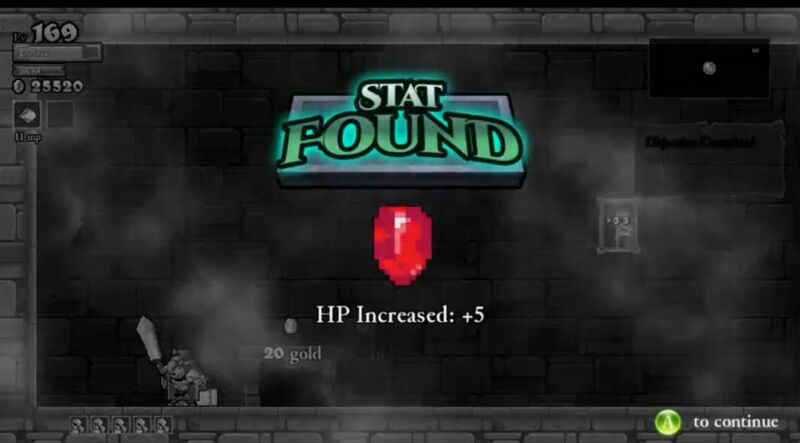 Even finding a second fountain for a health refill only extended the run for so long. I had a lot of problems with wolves on this particular character, for whatever reason not doing a good enough job of dodging them. Death ultimately came in one of the final forest rooms, in a chamber filled with McRib skeletons and skeleton archers. I actually flew into one of the archers for the last hit in a fit of stupidity. Given all of the health recovery items that appeared on this run, I probably should have done better here. Ah well. EDS and Hypergonadism traits. This was another character with the super knockback from the fireballs, which is generally pretty good on a Dragon. You never want monsters getting into close quarters, always preferring to shoot them down at a distance. I found a Sallos painting early in the castle, who dropped a Health bonus upon defeat. Definitely worth taking two hits (the second one totally unnecessarily) in the process. The dual mage miniboss also produced a Health upgrade, taking my character all the way up to 410 HP - yeah! Only 40 more of them needed to reach 500 health! Those were the highlights of the castle, which went very smoothly this time. I did a lot of stepping into and out of rooms in the forest, as a way to combat the little blobs. 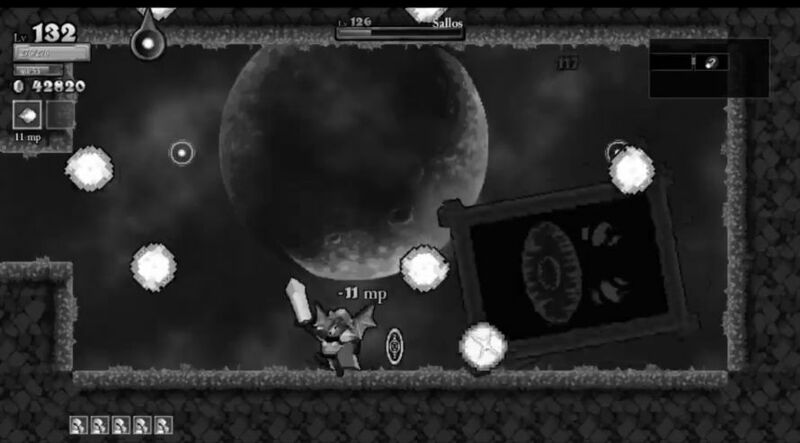 Unlike all other monsters in the game, damage will stick on them even if you exit a room. I'm assuming this is due to the way that they split into smaller and smaller pieces. This means that you can leave and re-enter rooms to your heart's content while fighting them, and I abused this thoroughly with this Dragon. Elsewhere in the forest, I nearly died in a room that had four McRibs up on a platform tossing their bones down to the ground below. It was nearly impossible to dodge their attacks, and difficult simply to get up to them to start shooting back. This whole region was tough going, and I had to dip into a few teleporter chickens to continue onwards. The tower entrance was even worse, a series of vertical rooms that I had no choice but to pass through, each one packed with enemies. There was no choice but to take hits and use the invincibility frames to race on past. Now I was stuck in the tower with 110 HP, needing to find the boss room's teleporter to get back to the rest of the dungeon. Fortunately I did find the boss chamber about four rooms later, and that opened up the route back to some of my saved up resources. The rest of the tower was easier, although still not routine. I dropped as low as 46 health at one point, and that forced the eating of the last few chickens. This was the first Dragon character to full clear the tower and head down into the dark recesses of the basement. I managed to make it all the way back to full health at one point; I guess a small upshot of the Dragon class is that you can restore back to full pretty quickly if you avoid taking damage. Sadly that didn't last long, as I was torn apart by a room that had six flying mages, four ninjas, and a central eyeball inside. Careful play extended the run for a bit, but only for so long. I died unsuccessfully trying to clear out that same room (pictured above). Still, this had been a sweet character overall. My first Dragon to crack 200k in gold had nearly gotten a complete dungeon map. With some additional levels, I'd have a great chance to finish the game with one of the new few heirs. IBS: you fart a lot. My Dragon's fireballs now did 245 damage with a fully maxed out Intelligence stat. Most monsters died in two or three hits, a welcome change from previous characters. This run got off to a terrible start, as I took one blow after another in the first room and dropped down to about 100 health remaining. A combination of two random chicken drops and heavy lifesteal from all those Vampire runes managed to get me back into the safe zone in short order. 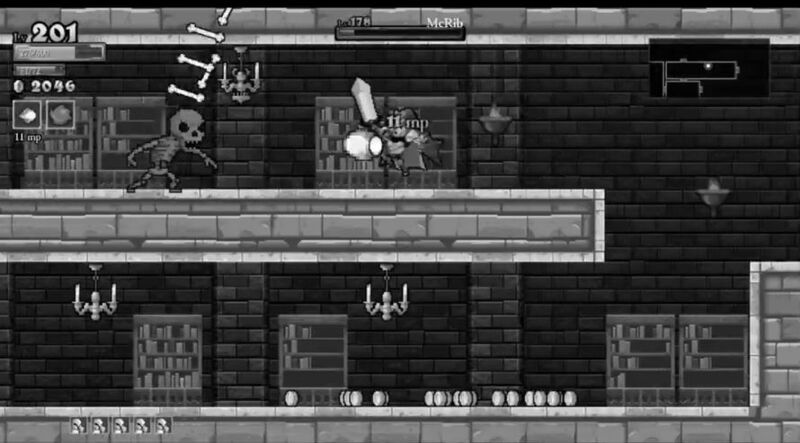 The castle continued to play tough in the early going, and I had to work through difficult room after difficult room. I suppose one advantage (if you can call it such) of the Dragon class is that you're never too far away from returning to max health, if only because max health is so very low. Even with a lot of mistakes, I found myself back at 412 HP rather soon. I did fight the dual plant minibosses, gaining only the useless Holy Sword for my troubles. I went to the forest next, and found that area to be easier than the castle. That's fairly common on the higher difficulties. 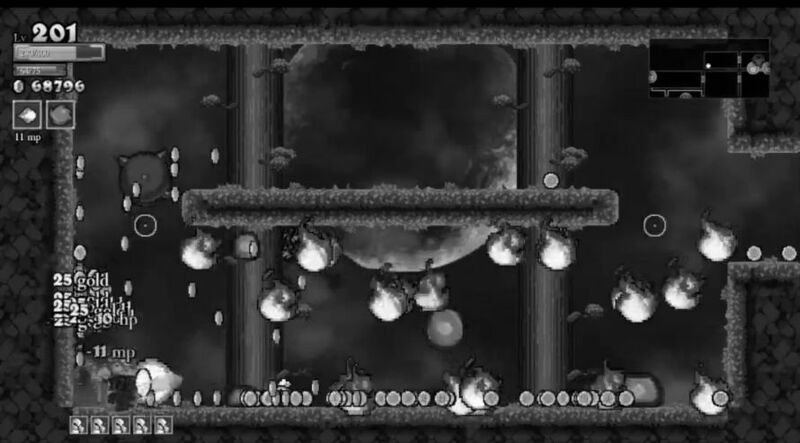 It was very nice having enough damage to kill the splitting blobs in a single fireball instead of needing two. There was also a hilarious moment where one of them jumped into a pit of spikes, kept dividing into more pieces, which also kept dying and them splitting again... I think that was worth about +100 health from vampirism right there. The tower was up next, and fortunately it seemed relatively routine. While fights were lively at times, I never dropped into the true critical range. I seemed to be growing in strength as the run went on, and I was confident heading into the basement that this character could finish the full clear. Even rooms packed full of monsters were going down without my Dragon taking a point of damage. Only two vertical rooms with lots of Chaintus (ball and chain) monsters caused any issue, and there were plenty of chickens back at the teleporters to raid for extra health. Calypso's Compass appeared in a secret shrine at the very end of the basement, and led me into the final remaining rooms down there. The secret chamber had the Retribution Sword (meh) and the Dark Bracers (yay! ), which I thought about using for future runs. This one was largely complete, however; the final few rooms were finished and I claimed my full dungeon clear. 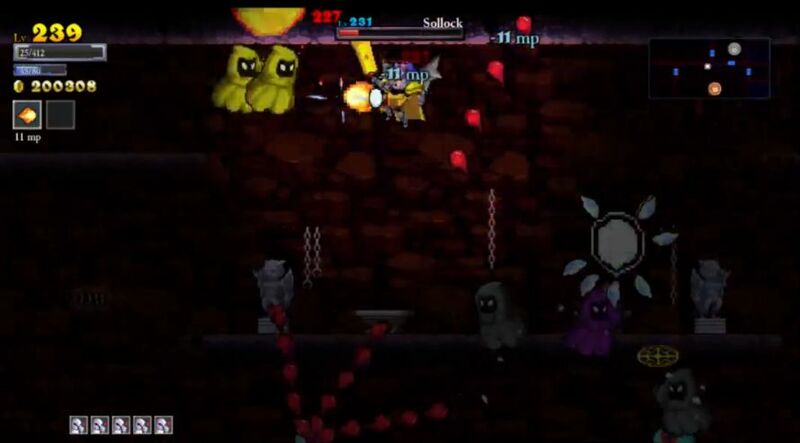 Three bosses remained to complete the run. I had fought Ponce de Leon earlier while clearing the tower, since I was sitting on full life at the time. By now I felt that I had mastered the flight movement of the Dragon class, and with such a large room to maneuver around in, Ponce stood no chance. He went down very fast without dealing any damage. The boss chest even had two Health bonuses inside, sweet! Herodotus was the next target, and unfortunately the blobs had just enough health to require three fireballs instead of two. I think they had 7 HP remaining, argh. Exactly the same as in NG+ difficulty heh. This was nowhere near as clean as my previous fight against Herodotus on the last difficulty, but I had plenty of lifesteal to work with, and my Dragon was never in any danger. The battle ended with my character on full health. I even found a random chicken inside the boss room. I left Alexander for last due to the trouble my previous heirs had experienced in New Game Plus difficulty. 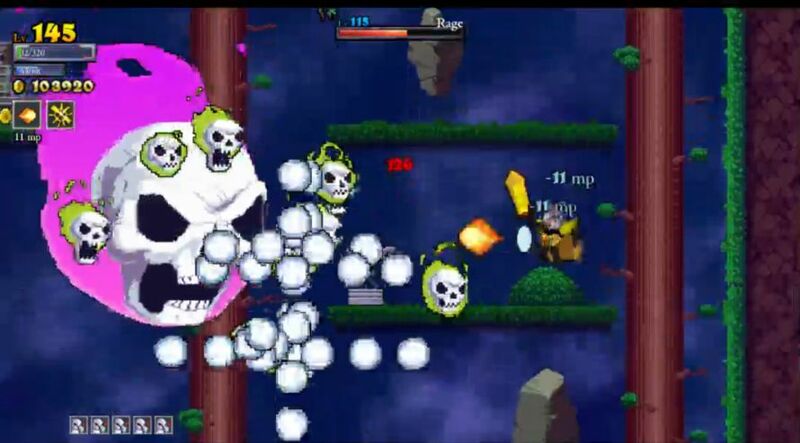 The skullhead minions had kept overwhelming my characters before I could shoot down the boss. This time was a different story, as the extra levels of fireball damage - and, cruically, more mana to work with - allowed my Dragon to take out Alexander before the minions could overwhelm her. Easy battle. 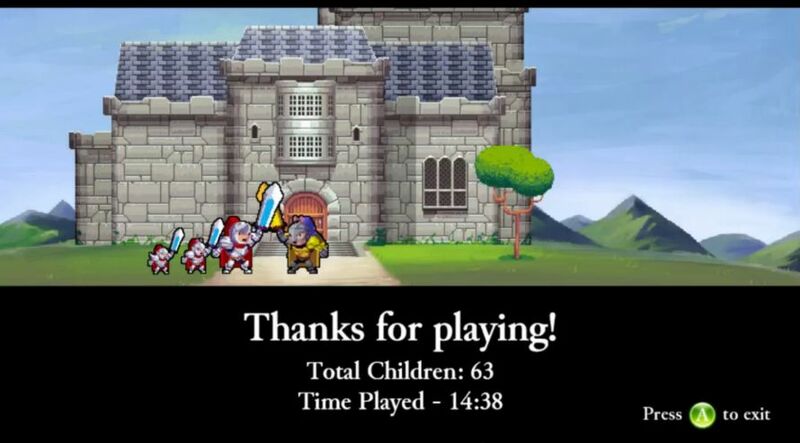 I finished the game with a paltry 420 health, the lowest total for any of my Rogue Legacy characters. I was honestly surprised that this didn't cause more problems, but the ability to fly truly did make a huge difference in avoiding damage taken. The magic damage stat was fine for NG++ difficulty; I would not have wanted to take a Dragon character any further though, not with fireballs lacking any ability to critically strike. I was still left using the Guardian Sword and Guardian Cape at the end of the game for the armor bonus, and lack of any superior options. I certainly didn't need even more vampirism beyond the five Vampire Runes, and anything that added damage or critical strike chance was useless. The Dragon class certainly ends up with some weird stats. 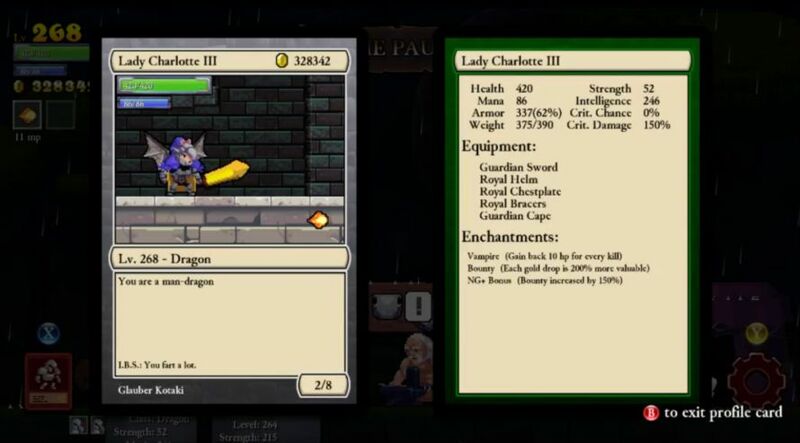 Nevermind the heir total listed in the screenshot, which reflected an unusually large number of non-Dragon characters who were forced to suicide. I needed only 20 total characters to complete the three dot run, and that included the three non-Dragons that I used initially to unlock the class. That total of 20 was one of the lowest for any in the Class Legacy series, right up there with the Barbarian (18 characters) and Shinobi (18 characters) amongst the top classes. The 20 heirs used for the Dragon class were actually less than I needed for the Assassin and Spellsword, which each required 22 total characters. Never thought that would happen... I was consistently surprised at how well the Dragons performed across this challenge. The ability to fly indefinitely truly did make up for all of the many disadvantages attached to this class. The designers of Rogue Legacy knocked it out of the park when designing this class (unlike the poor Lich which needs a complete redesign). The Dragon is the ultimate high mobility / zero survivability glass cannon role. If you can manage the high skillcap, it's a very powerful class indeed. This was a complete blast to play, and a fitting end to this series. Thanks for reading. I hope you enjoyed this look at Rogue Legacy - I think it was worth the five dollars I paid for the game!